Tomar (formerly spelled Thomar) is a small, historic town in central Portugal, about 145 km north east of Lisbon, best known for the remnants of an impressive Templar fortress and a superb monastery that attract many visitors. 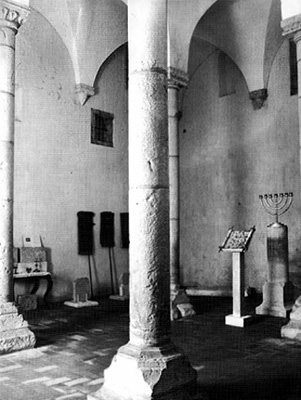 Less well known is the synagogue of Tomar, the oldest extant Jewish prayer house in Portugal. There seems to have been a Jewish settlement in Tomar already during the early 14th century, as suggested by an inscription on a gravestone mentioning a rabbi Josef of Tomar who died in Faro, in southern Portugal, in 1315. An official Spanish document issued in Zamora on October 26, 1475 by D. Alfonso V mentions the Jewish community of Tomar. The synagogue appears to have been built in the 15th century, sometime between 1430 and 1460, when the local Jewish community acquired some prominence. The synagogue was situated in the middle of the Judearia (Jewish quarter), on what was later known as “Rua nova que foi judaria” (“the New street that was the Jewish quarter”) corresponding approximately with area now located between the modern streets of Rua Direita dos Açougues and Rua dos Moinhos. 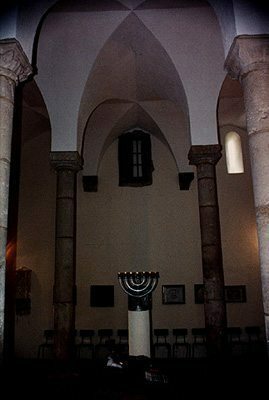 The synagogue of Tomar was in use until 1496, when King Manuel I “The Fortunate” of Portugal issued an edict, according to which the Jews had the choice to either convert to Christianity or to leave Portugal by October 1497. As a result of the new policy, the synagogue ceased to function, probably in 1497. The building was consequently sold to a private person. It was sold again in 1516 and converted into a prison serving the town and its region, instead of an older prison that previously functioned in the local castle. The prison continued to function in the building of the former synagogue until probably the middle years of the 16th century, when it was transferred to the city hall. An Inquisition tribunal was established in Tomar in 1543, but its activity was suspended in 1548, not before two executions (auto-da-fe) took place. According to some notes in the parish records of a local church in Tomar, it seems that the building of the formar synagogue was used as a Christian chapel in the early 17th century. In late 19th century the building served as a hay loft. Jose Joaquim de Araujo, its owner, sold it to Antonio Vieira da Silva Neves and upon his decease the building was inherited by his son-in-law Joaquim Cardoso Tavares. The building, used as a grocery warehouse at the time, was recognized as a national monument in 1921. The modern story of the Synagogue of Tomar is linked to the activities of Samuel Schwarz who purchased the building in 1923. A native of Zgierz, Poland, and a mining engineer, Samuel Schwarz (also spelled Szwarc) (1880-1953), is best known today for his discovery of crypto-Jewish families in north-eastern Portugal, chiefly in the town of Belmonte. Because of the outbreak of WW I Samuel Schwarz and his wife could not leave Portugal where they were honey-mooning. They decided to stay in Portugal for good, where Samuel Schwarz dedicated himself to restoring and organizing Jewish life in that country, even serving for a time as President of the Jewish Community of Lisbon. Samuel Schwarz undertook at his own expense the works of cleaning and excavation of the synagogue of Tomar. Plans to transferring the building to the State of Portugal could not be realised because of a lack of funds. Only in 1939, following a donation by Samuel Schwarz, the building was converted into a museum. In return Samuel Schwarz and his wife were granted Portuguese citizenship that protected them during the Second World War. 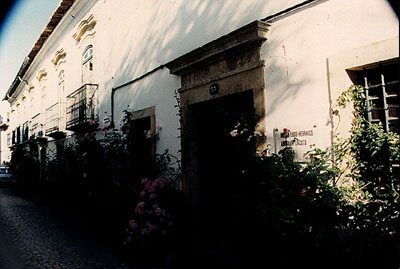 Located at 73 Rua Dr. Joaquim Jaquinto, the Synagogue of Tomar features a white painted plain façade. The interior boasts a rectangular main prayer room of about 8 meters on each side. The ceiling is supported by four pillars with twelve pointed arches in the Moorish style much appreciated in the Iberian countries during the middle ages. In Sephardi tradition, especially among Jews of Portuguese origin, the four pillars symbolized the four mothers of Israel: Sarah, Rebecca, Rachel, and Leah, while the twelve arches are thought to represent the twelve Tribes of Israel. The four upper corners of the room contain clay jars incorporated into the walls upside down, an ingenious traditional method employed in the Middle Ages for improving the acoustics. Modern additions include wooden chairs facing from three sides the central bimah. The Torah scrolls are being kept in a wooden cupboard. Old stone carvings that apparently ornamented the original structure are exhibited around the room walls. A second smaller room is situated next to the main prayer hall and is partially below the current street level. Discovered in 1985, it was originally used as a mikveh – a ritual bath. It houses a collection of artifacts, especially ceramic bowls that are displayed around the pool of the mikveh. 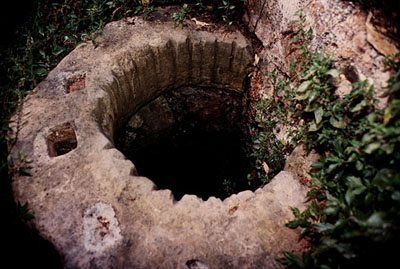 A well, half covered by a more recent wall, has been discovered in the patio behind the mikveh, its edge bears deep cuts from ropes. The building of the synagogue houses the Museu Luso-Hebraico Abraham Zacuto (the Abraham Zacuto Portuguese Jewish Museum). Named after Abraham Zacuto (c.1450-c.1522), a mathematician and author of the celebrated Almanach Perpetuum, a book published in Leiria in 1496 that contains mathematical tables largely used by Portuguese navigators during the early 16th century and beyond. The exhibits include various archeological findings attesting the Jewish presence in Portugal during the Middle Ages. Among numerous gravestones that form the bulk of the collection, mention should be made of an inscription, dated 1307, from the former main synagogue of Lisbon, and a second notable 13th century inscription from Belmonte on which the Divine Name is represented by three dots in a manner reminiscent of the ancient Hebrew manuscripts from the Dead Sea. The museum also holds a small collection of modern artifacts describing Jewish way of life that have been donated by individuals and Jewish institutions from various parts of the world.